A 28ft (9.5m) humpback whale (Megaptera novaeangliae) was found dead in the River Thames near the Dartford Bridge early on Saturday morning. Scientists from the Zoological Society of London (ZSL) and members of British Divers Marine Life Rescue (BDMLR) received reports that a whale had been spotted in the Thames on Thursday afternoon, but no further sightings were made until the animal was found dead on Saturday and subsequently recovered by a Port of London Authority (PLA) patrol boat. 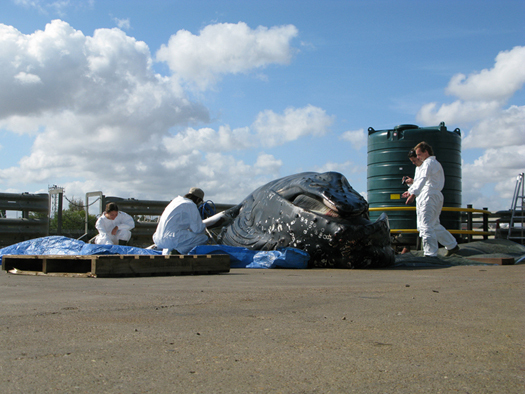 The team of scientists from ZSL, who were also involved with the rescue of the Thames whale in 2006 and the mass dolphin stranding in Cornwall last year, carried out a post-mortem examination of the juvenile male humpback whale in-situ in facilities provided by the PLA. The post-mortem examination was undertaken as part of the Defra funded collaborative UK Cetacean Strandings Investigation Programme (CSIP), which is managed by ZSL. Rob Deaville, project manager of the CSIP said “Preliminary results from the post-mortem examination indicate that it may have died as a result of starvation, but further tests are still pending and may provide additional information about what happened to this whale”. 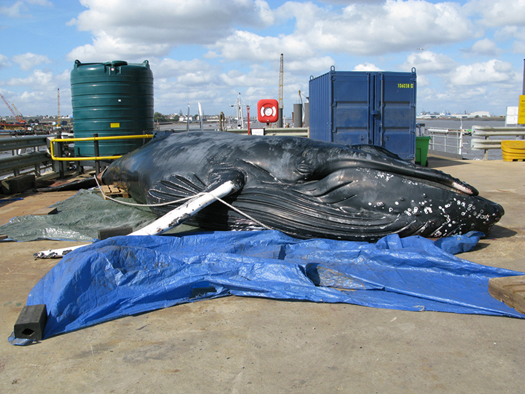 This is the first time that a humpback whale has been found in the Thames. The last humpback whale found stranded around the UK coast line was in 2007 at Port Talbot in Wales. Strandings that undergo post-mortem examination can also provide a unique insight into causes of death, diseases, environmental contaminant levels, reproductive patterns, diet and other aspects of the general health of cetacean populations in the seas around our coasts. This provides important baseline data to help detect any future outbreaks of disease, unusual mortality events or responses to environmental change (e.g. climate change). Information from the post-mortem examination will be added to a database on stranded cetaceans, which is managed by the CSIP and provides an essential resource for identifying factors which may cause cetaceans to strand, helping to prevent these events happening in the future. A juvenile male basking shark (Cetorhinus maximus) was found stranded at Whitesands beach near Sennen in Cornwall today, 11th August 2009. Volunteers from the Cornwall Wildlife Trust Marine Strandings Network attended the stranding and ascertained that it was in suitable condition for post-mortem examination. CWTMSN volunteers then assisted with the retrieval and transport of the basking shark by Penwith local authority. A post-mortem examination was subsequently carried out by staff at the Veterinary Laboratory Agency (VLA) in Truro, under the collaborative UK Cetacean Strandings Investigation Programme. 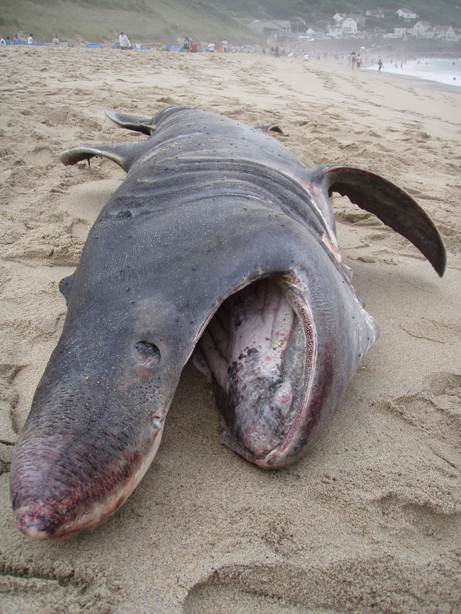 James Barnett, veterinary pathologist at the VLA, said “This young male basking shark measured 4.21m. It was too long and too heavy to weigh, but it was in reasonable body condition and there was evidence that it had fed recently. It appeared to have a gastritis and there was some haemorrhage of the ventral gill slits which possibly may have been associated with live stranding”. Follow up investigations are pending and full results will be released shortly. This is the first such examination carried out by the CSIP in England. Staff at the Scottish Agricultural College, Inverness carried out the first CSIP examination of a stranded basking shark in 2007. 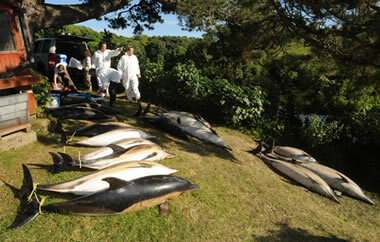 A report has been released today on the comprehensive investigation into the mass stranding of common dolphins (Delphinus delphis) that took place in the Fal Estuary in Cornwall on 9th June 2008. The investigation was co-ordinated by the collaborative UK Cetacean Strandings Investigation Programme (CSIP) which is currently managed by the Institute of Zoology, ZSL. The report into the Defra funded investigation can be found here. Other organisations that contributed to the report included British Divers Marine Life Rescue, Centre for Environment, Fisheries and Aquaculture Science, Cornwall Wildlife Trust Marine Strandings Network, Joint Nature Conservation Committee, Southwest Fisheries Science Centre, Universidad de las Gran Palmas Gran Canaria, Veterinary Laboratory Agency (Truro) and Wildlife Veterinary Investigation Centre in Cornwall.